REMOVABLE LEGS. 4" SWIVEL CASTERS (2 LOCKING & 2 NON-LOCKING) NICKEL PLATED HEAVY DUTY ADJUSTABLE COOKING GRATE. 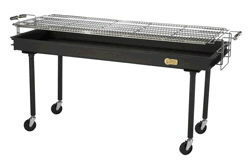 * Please call us with any questions about our charcoal grill portable 60 inch rentals in Old Town ME, Milford, Bangor, Pea Cove, Eddington, Bradley, Orono, Bangor ME.